Speedify is commonly used to improve the streaming of video from live events. 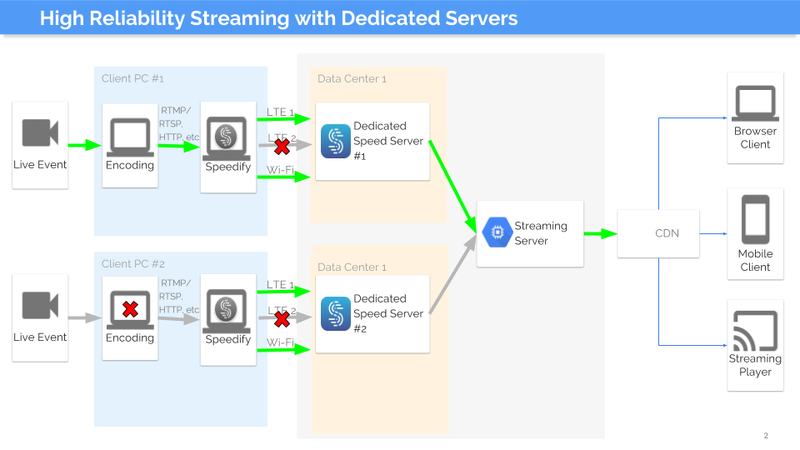 Whether the video is Facebook Live, Periscope, Twitch, RTMP, RSTP, or any other protocol, Speedify offers better streaming by allowing multiple connections to be combined for better throughput and reliability. 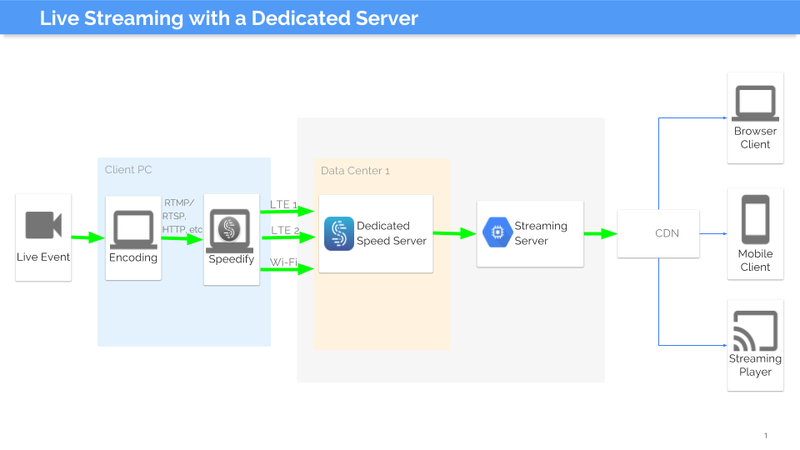 Most users can get started with streaming using our standard accounts and public Speedify servers, but those doing professional streaming might prefer to have Dedicated Servers. This means that no one else is on the same hardware at the time. Below is a typical setup, in which a film crew has a laptop which does the encoding and the Speedify client. Here, the laptop has 3 connections: 2 LTE connections and one Wi-Fi connection. The video stream is distributed among the 3 connections, and then reassembled by the Dedicated Speed Server to deliver to the Streaming Server. For even higher reliability, some customers have gone to a "shared nothing" architecture. Here, there are two different Speed Servers each hosted at a different data center, and two different PCs, each of which has a complete streaming setup, and which connect to different Speed Servers. Dedicated Speed Servers are very reliable; however major internet outages happen several times per year, and if the value of an event is high enough, this can be a significant risk. To guarantee that each computer connects to a different Speed Server, use the Speedify Commandline Interface. If the connection to the specified Dedicated Speed Server fails, it will connect to another to Dedicated Speed Server if one is available. In the picture below, the encoder on the second PC and the second LTE carrier have both failed mid-event, and yet the video continues to stream, from the first PC, using only the LTE 1 and the Wi-Fi. For more information, use the link below to contact us.